Milk replacer feeding is an essential phase of animal husbandry. The performance of your stock and the long term profitability of your business depends on optimum results at this important stage. Lactalis Milk Replacers will support the success and performance during this crucial phase. Milk is the first determining food in the development of all animals, in particularly calves. Barrett Agri in partnership with Lactalis Feed has brought to the market a range of world leading milk replacers. (The Company) Lactalis is a family dairy group, is situated in the West of France. From its foundation in 1933 the group has expanded rapidly, to become a multi national business employing 61,000 people on 5 continents. The Group operates in over 200 production sites in 37 countries worldwide. • Largest Dairy Group in the World. Turnover of €16 billion. • Largest Cheese Producer in the World producing a series of prestigious French and International brands. Lactech is formulated to target the necessary growth rates for high performance dairy and beef calves. The total protein and fat ratio has been designed to optimise calf development through to weaning. Target daily growth rates of 0.7kgs + per day are achievable with this quality all-rounder milk replacer. 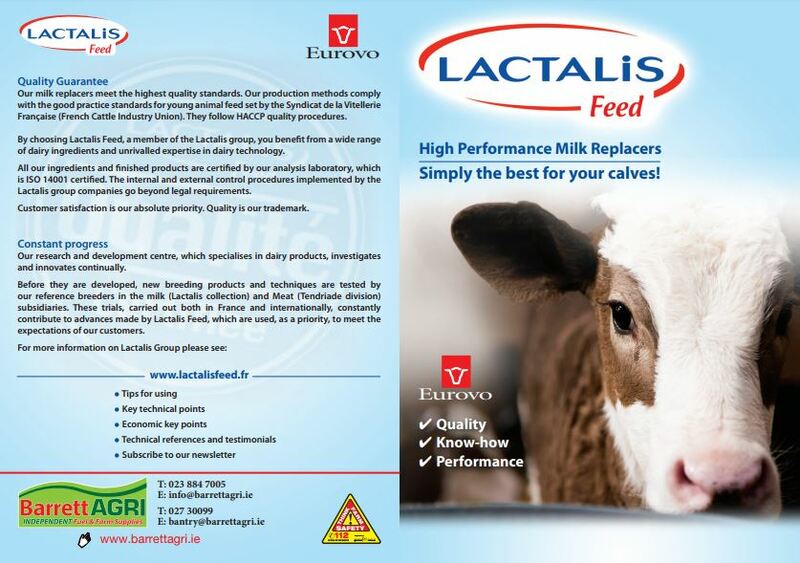 Eurovo 26 is formulated for high performance dairy replacement stock. Designed with high levels of dairy protein and ideal amino acid profiles, it maximises growth performance at the critical early development stage. Growth rates of 0.9 kgs + per day are achievable with this premium milk replacer to meet the target size and weight for bulling and calving. Volac calf milk replacers are designed to promote healthy, fast growth, in young animals. • Blossom is the most popular milk replacer in the Volac range and is formulated to achieve excellent growth rates for both Dairy and Beef calves. • Is suitable for once and twice-a-day feeding and some ad-lib machines requiring an instant mixing powder. • Heiferlac has been designed specifically for modern Dairy Heifer calves and contains very high levels of Pure Dairy Protein, Lactose and specially selected Vegetable oils. Consult Our Team to discuss your requirements.